Sen. Bob Corker, R-Tenn., accuses the "powers that be" of killing his attempt to rein in Trump's trade policy. WASHINGTON — The simmering division among Senate Republicans over President Donald Trump's trade policies erupted Tuesday when Sen. Bob Corker, R-Tenn., was blocked from offering a measure that would have reined in the president from the growing practice of imposing tariffs on imports. 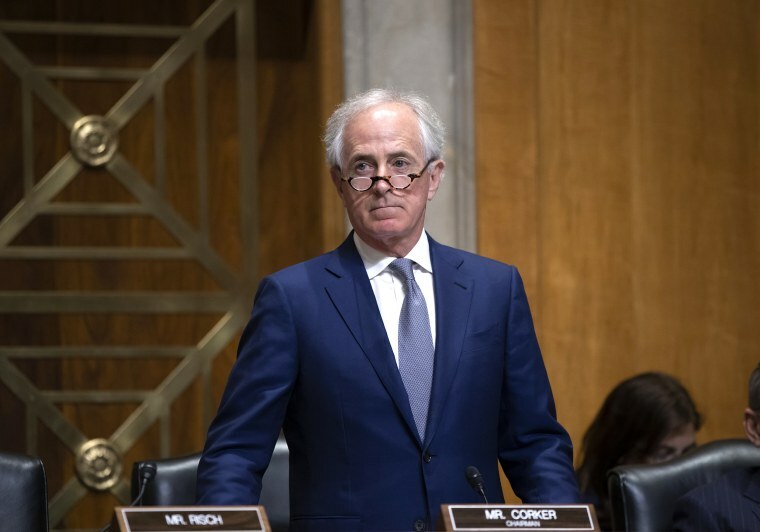 In an angry speech on the Senate floor, Corker slammed the “powers that be” for blocking legislation that would have put checks on the president's ability to levy tariffs, especially on friendly nations, in the name of national security. Sen. James Inhoffe, R-Okla., used a procedural rule to effectively quash Corker's measure but the Tennessee senator said he didn’t blame Inhofe. “He’s doing what other people have asked him to do,” Corker said. “A lot of them would vote for it," Corker said of his GOP colleagues. "But no, no, no, 'gosh, we might poke the bear,' is the language I’ve been hearing in the hallways,” he said, mockingly. “The president might get upset with us as United States senators,” Corker continued. “It’s politics, it’s politics,” Corker later fumed to reporters. “It’s ridiculous that people can’t vote on amendments." The episode capped a week of internal debate among Senate Republicans, who are traditionally advocates of free trade, on how to address the Trump's aggressive trade policies. The president has announced new tariffs against Canada, Mexico and Europe and had a contentious meeting with allies at the Group of Seven meeting in Canada over the weekend. While many in the party are concerned about the president’s actions to retaliate against other countries’ trade imbalances, some, including Sen. John Cornyn, R-Texas, have been cautioning colleagues against picking a fight with the president just six months before a the mid-term elections on the president’s signature issue. One Republican campaign aide who works with GOP candidates and spoke only on background said McConnell doesn’t want to get into a public fight with the president. Senators have acknowledged the damage a presidential Twitter tirade against Republicans could cause the party in a difficult election season. “Every ounce of power possible is going to be used to keep from voting on this amendment because, well my gosh, the president might not like it,” Corker said in his floor speech. Senate Majority Leader McConnell, who rarely does hallway interviews, was asked by NBC News to respond to Corker’s tirade but he pointedly refused to respond as he walked the length of the Senate basement. McConnell hasn’t tipped his hand to the conference on the issue. But one Republican said McConnell, who is concerned about keeping the Republican majority in the fall, could have been undermining Corker's effort. “He can sometimes undermine something without you even knowing it, but act like he’s supporting it,” the senator who was granted anonymity to speak freely, said. McConnell said last week that he didn’t think Corker’s amendment was necessary, and in an interview on Monday with NBC News, McConnell seemed to hedge when asked about it, suggesting it’s unlikely Corker will win his battle. In the interview, McConnell warned that previous attempts to allow an open amendment process on the Senate floor, for instance during a debate over immigration laws, led to gridlock. “I tried to have a totally open debate on immigration and we ended up having a situation where members on both sides were objecting to each other’s amendments,” McConnell told NBC. The aide described a White House meeting last week with 15 senators whom Trump summoned to express his opposition to Corker’s initiative. The aide described the senators as having been swayed by the president’s argument that he needs “certain tools of latitude” when it comes to trade. The aide said Trump reiterated that his ultimate goal is to have no tariffs and trade barriers at all. Sen. David Perdue, R-Ga., was one of those senators who Trump persuaded. The free-trade Republican admitted on Wednesday to being surprised that he supports the president’s tariffs, but said that members of his party has to trust the president on this. Other GOP activists see it as a fight that goes to the heart of the party. “This is a big moment for congressional Republicans. Are they going to meekly let slip away a pillar of modern conservatism, which is free trade, or are they going to actually stand and fight a long term battle to explain the virtue and the benefits that free trade brings?” said Tim Phillips, president of Americans for Prosperity, a conservative advocacy group that supports free trade.